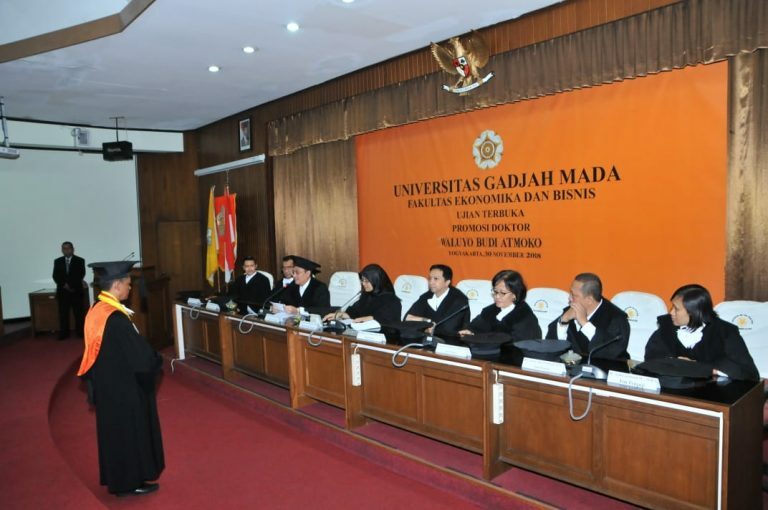 Yogyakarta – Friday, November 30th 2018, Master of Science and Doctorate Program, Faculty of Economics and Business, Universitas Gadjah Mada (MD FEB-UGM) held a public defence on behalf of Dr. Waluyo Budi Atmoko, MM. Dr. Waluyo Budi Atmoko, MM who is a student in Management Studies Program FEB UGM who is also a Lecturer in the Management Program Study, Faculty of Business Accounting, Setia Budi University. Dr. Waluyo Budi Atmoko, MM get the 4249th Doctorate which passed the exam at Gadjah Mada University and the 261st which moved the exam at FEB UGM with a Very Satisfactory predicate. The Promoter is B.M Purwanto., M.B.A., Ph.D and the co-promoter consisting of Sahid Susilo Nugroho., M.Sc., Ph.D and Bayu Sutino., MSM., Ph.D. The public defence chaired by Nurul Indarti, Sivilokonom, Cand. Merc., Ph.D along with members of the team Bayu Aji Aritejo., MM., M.Sc., Ph.D. Suci Paramitasari Syahlani, MM., Ph.D., Anton Agus Setiawan, M.Sc., Ph.D., and Yulia Arisnani Widyaningsih., M.B.A., Ph.D.
Dr. Waluyo Budi Atmoko, MM achieve his doctorate after defending his dissertation entitled “Emotions as Explanatory Factors of Ethical Buying Behavior and Moderation in the Relationship between Intention to Ethical Buying Behavior and Ethical Buy Behavior in the Context of Local Brand Purchases”, in front of the examiners. This study produced two conclusions, namely the main problem to encourage changes in ethical buying behavioural intentions to ethical behaviour is the effort of the gap between intention and behaviour. Emotions directly influence ethical buying behaviour, which in the context of purchasing a local brand, the behaviour of consuming local products can be changed solely based on exposure to emotional stimuli.